The versatile Ori guest bedis a day time sofa, a single put me up and a pull out double bed all in one. The two slim Naturalmat mattresses are made from organic coconut fibre and covered in recycled organic Kvadrat textiles. Wellbeing is at the heart of what we do so we are fascinated by Another Country’s Ori furniture collection in collaboration with design studio Ekkist, which explores biophilic (nature-inspired) design as a way of improving health and well-being.Natural materials, light, air quality and aesthetics are the focus with products made from sustainably harvested ash. 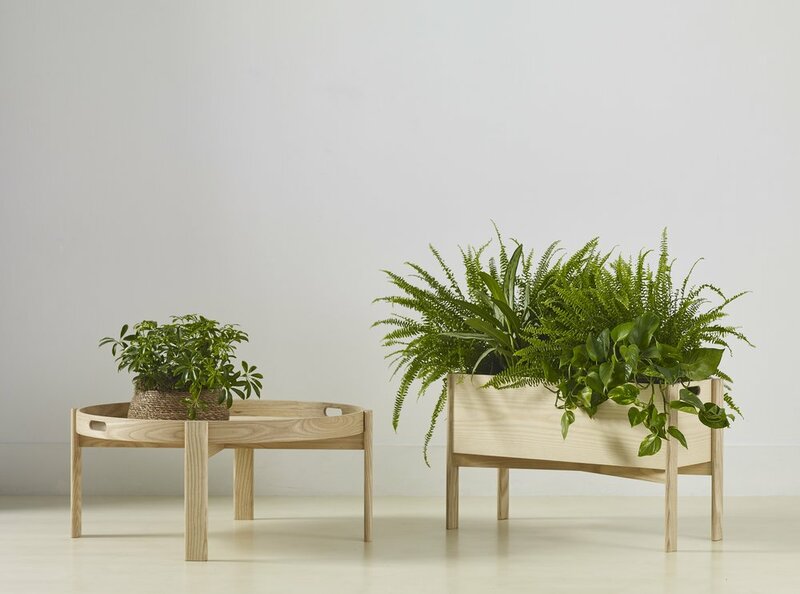 Among our favourites are the Ori planter, a refined take on a familiar outdoor planter, which filters the air whilst bringing nature into the home, and the Ori coffee table with handles to encourage movement and a flexible approach. 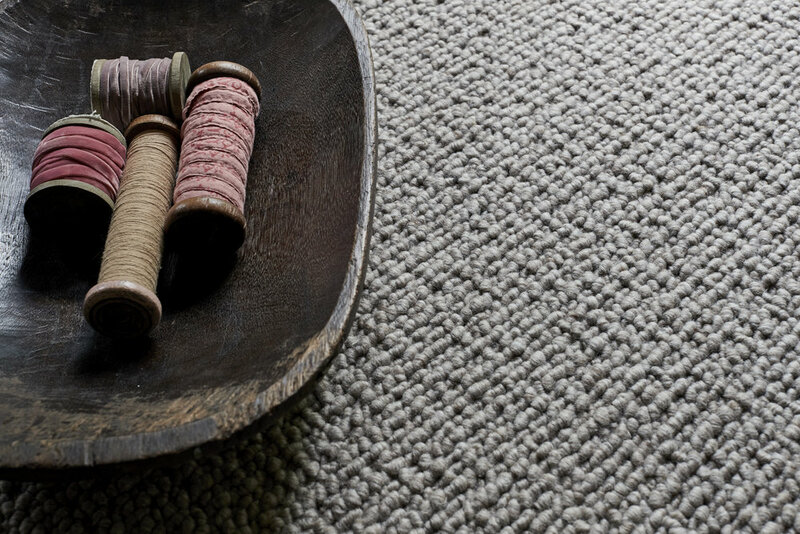 We’ve long been looking for a wool alternative to sisal, which is more textural and visually interesting, and we think we’ve found it with Crucial Trading’s new Wool Snug range. It’s deeply luxurious with a varying weave that gives a pebbly look, providing great contrast as well as comfort. The award for most sensual and evocative presentation goes to champions of luxury craft The New Craftsmen. We were mesmerised by William Waterhouse’s brass decorative kinetic sculpture. The piece is inspired by how plant stems move in water and is activated by the flow of air in an interior space. Also showcased at The New Craftsmen were furniture and accessories from makers working across a range of disciplines from wood turning to ceramics, as well and an exclusive range of table lights from artist and designer Malgorzata Bany, who co-curated the show. Reflecting her affinity for raw natural forms, Malgorzata’s ‘Holm’ lighting evokes the islands found in river estuaries from which the collection takes its name. The lights come in two organics shapes available in contrasting colours, paired with delicate shades constructed from bespoke paper and stems in a variety of metal finishes. Malgorzata often works with Jesmonite, a modern material that is stronger and more durable than plaster, yet smooth, soft and cool to the touch like stone. A malleable material, it can be pigmented, carved liked stone or finished like wood. Exhausted from hours of hot-footing it around Decorex we couldn’t believe how extraordinarily comfortable Pinch’s new Angelo sofa is. We have no truck with beautiful but uncomfortable sofas, but this one is not only supremely comfortable, it can adapt to corner sections and retains the elegance and refined simplicity we’ve come to expect from the British design studio. The sofa was 12 months in development and inspired by Pinch’s Creative Director Oona Bannon’s intention to spend more time sitting still. A lady after our own hearts. We also loved the raw plaster walls on their stand. Definitely our best in show. Such a beautiful grouping from East London based ceramic artist Naomi Bikis of Bikis Ceramics. Each piece is one-of-a-kind and her new Soft, Soft Hard range blurs boundaries between sculptural objects and functional vessels, exploring the relationship between the perfection of the wheel and the mark of the maker’s hand. They’ve gone straight to the top of our wish list.